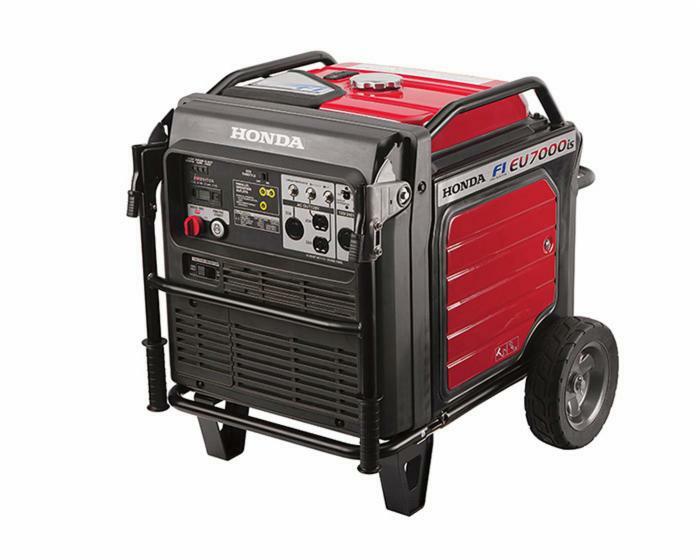 Honda Generator EU7000iS delivers 7,000 watts of super-quiet power to claim its title as Honda’s most powerful EU Series model. Equipped with Eco-Throttle™ and power-stabilizing inverter technology, this generator is designed to run RV air conditioner units, refrigerators, and other common appliances. An i-Monitor™ LCD display also simplifies diagnostic readings, while easy-folding handles allow for convenient transport and storage. Plus, with a 3-year warranty, your EU7000iS is covered through years of home and campsite use. UNFORTUNATELY, WE ARE UNABLE TO SHIP TO PUERTO RICO. Need help deciding if this is the right product for you? Check out our buyer’s guide for tips on choosing the right generator for your needs. * Ideal for home, RV, and outdoor use – powers refrigerators, microwaves, furnace fans, sump pumps, RV air conditioner units, TV/DVD players, hair dryers, coffee makers, etc.